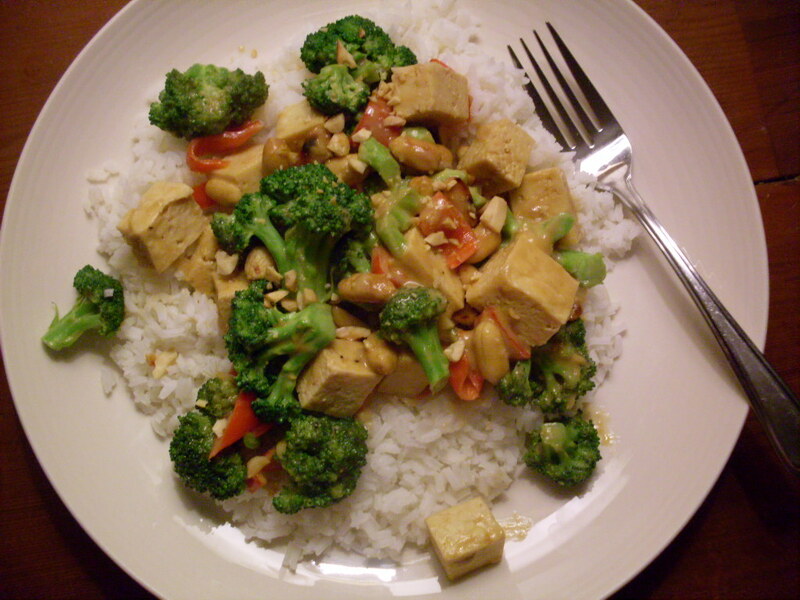 Broccoli with tofu and peanuts. To be honest, I only started eating broccoli recently. There are only a few things I have decided there’s no getting over, and I really thought broccoli would be one of them. But when you compare it to actually gross things like green peppers (why not just choose red? ), raw bananas (potassium mush phallus), or even – ick! – raisins (most of which are probably dead flies, and there’s no arguing with me on this one), it’s not so bad. It’s actually kind of okay. And you don’t even have to drown it in cheese sauce, though if you did it certainly wouldn’t ruin anything. So how did broccoli, with its tendency to taste like damp socks that’ve been festering inside rubber boots all day, manage to make the cut? Well. Let me tell you: It doesn’t have to taste like damp socks festering in rubber galoshes. The secret is to not cook it to death. It must not lose its texture or brilliant green colour; it must not turn to putrid swamp mush. Kept tender-crisp and bright, it’s actually (and I never thought I’d say this) DELICIOUS. And with peanuts? Well, well. It’s (and I never thought I’d say this) DINNER. And so we have another Meatless Monday recipe. Check out the blog carnival over at Midnight Maniac for other meatless recipes! 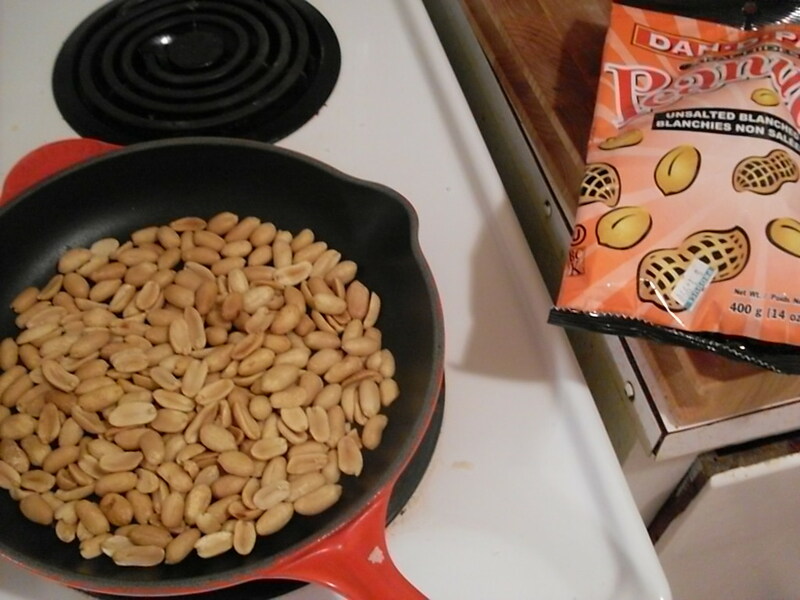 First, toast your peanuts in a pan over medium heat. Watch them. Diligently. When they start to smell like roasted peanuts, turn golden, and sweat, remove them from heat and set them aside. Divide into two piles, and chop one pile. Blanch chopped broccoli by plunging it into boiling water, boiling for two minutes, and removing immediately to ice water, where it should sit for a minute. Save 1/2 cup of the blanching water. Set aside. In a large pan, heat oil over medium-high heat. Add shallot, garlic, and ginger, and sauté until just golden. Meanwhile, mix peanut butter, soy sauce, sesame oil, sriracha, one tablespoon of sugar, and lime juice. Taste. If it needs more sugar, add more. Add pepper. Taste again. If it needs to be spicier, add more sriracha. Add red peppers to the pan, and tofu. 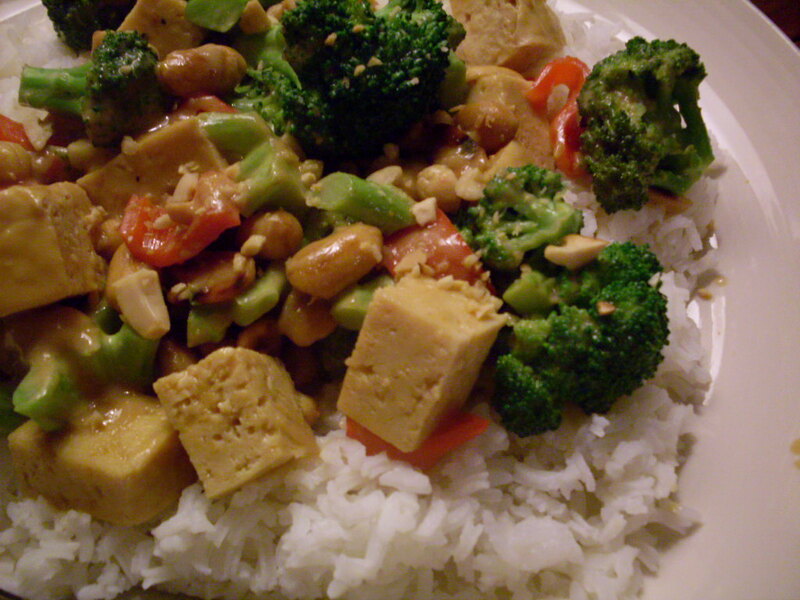 Stir one third of the peanut sauce into the pan, and add a quarter cup of the blanching water to thin. Cook until peppers have softened, about two minutes. Add broccoli, and then remaining peanut sauce. Stir to coat, then toss in whole peanuts. Serve over rice, sprinkled with remaining peanuts. Taste. See? It’s good. Broccoli is good. Amazing. < Previous Persimmon oatmeal cookies. Nom nom! I love it with peanuts. I didn’t start eating it (again) until really recently — maybe 2-3 years? I was having fierce, painful allergic attacks to it, complete with really severe stomach cramps and wheezing. Turns out it’s a pesticide they used to use more than they do now, or something like that. Every once in a while I still react to it but it is so rare now. Now if someone could just redeem zucchini and/or mushrooms for me. Is it just me, or do they both have weird soapy aftertastes? Ha! I am glad I’m not alone with some of these. I usually use currants instead of raisins – somehow they don’t gross me out in the same way. Those cookies DO sound good … Bananas I will not be getting over anytime soon. I still remember my Dad putting them in my lunches and by the time I got to school everything would taste like banana, even through plastic wrap. It was so gross. We use them so rarely here because I’m convinced if I have a bunch on my counter all the groceries will start to taste like banana and it will be just like second grade, tears and everything. Maybe it was the pesticides making it taste like feet – I buy organic broccoli now, because I suspect its soft tops are probably sponges for whatever’s sprayed on it, and I can pretend like the organic stuff is only sprayed with love and glitter. Organic pesticides aren’t much better, but still. It’s easier for me to remain deluded. Though mushrooms and zucchini are two of my favourites – no soapy aftertaste for me, but that’s not to say there isn’t one; I think green peppers taste like Pine Sol, but seem to be the only one. Ha! I so agree with you on the RAISINS! 🙂 But green pepper? It has its use! And ripe organic bananas..? Even if you just use it in a carrot cake — can’t do without!